Welcome to Helsinki I saw through a manual 35mm f/2.5 lens (read: vintage) that I got from a second hand shop for a handful of coins in the morning. Today the weather was windy and overcast. The temperature hovered around +5 Celsius but the sea air felt colder. You may wonder if I photographed during some strange hours because there are hardly any people in the pictures. No, I didn’t. This is as busy as it gets between the noon and three in the afternoon in one of the smallest and most provincial capitals of Europe. I must have seen more statues than living persons of whom one was playing a cello, hands frozen (far below). Below (left) is one of the main entrances to the center of Helsinki. The farmers’ market is on the other side of the road. Today there was only one vegetable vendor; looking at the number of clients, it’s understandable! Even 'the only client' looks bewildered. 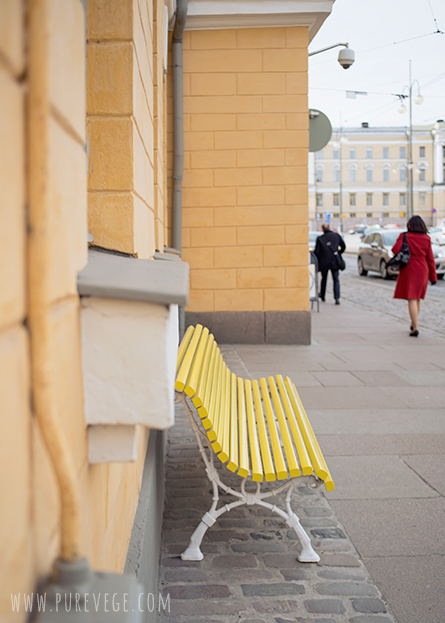 The yellow bench made my day! Adorable, isn’t it? 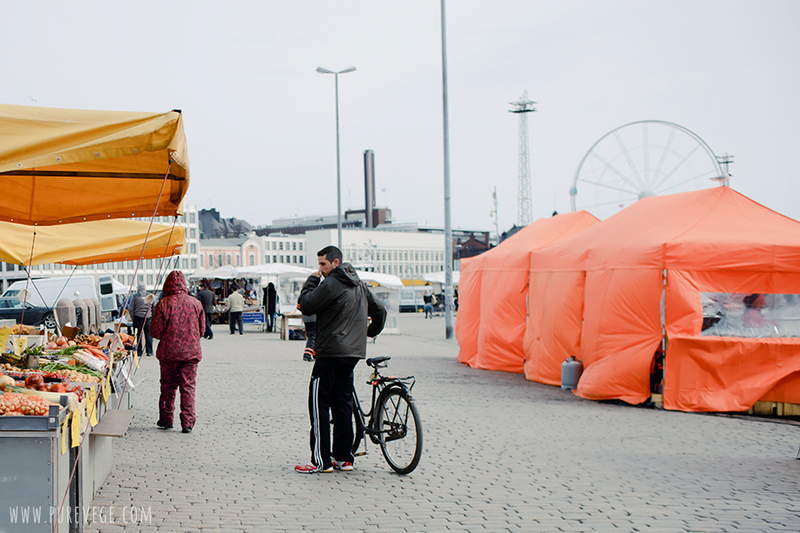 There isn’t an old town in Helsinki, like in Stockholm or Copenhagen, or even Tallinn. There are only a couple of small streets that remind of the past. I found some interesting color details there. Narcissus are everywhere, it seems. Peppermint candies! I didn't "notice" them before I uploaded the images on the hard-disk. When photographing, I only saw red and white! It didn't cross my mind it was something edible. Perhaps it was a blessing. Poor Japanese tourist (far right) wasn’t prepared for the weather. Marimekko had placed cushions on the street: a great idea! I was tempted to try them but restrained myself because a human statue (golden Elvis?) was staring at them. He probably wanted to sit down too! For someone having a standing profession, it is a convenient place to work. Love the teddy bear in the Museum window, and the idea of huge cushions on the sidewalk. Your photographs are pure magic, Lakshmi! Enjoyed looking and lingering over each one of them. Beautiful. 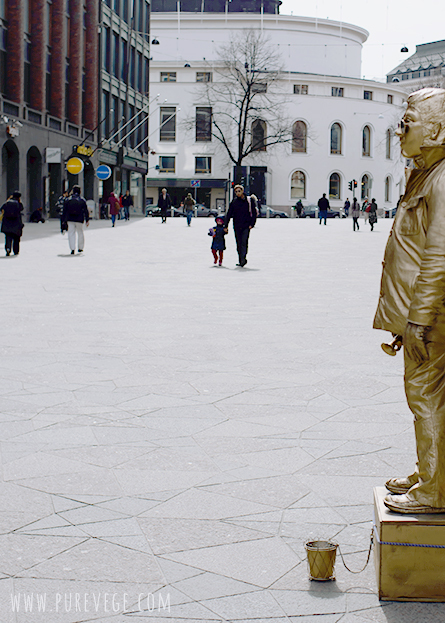 We flew to India through Finnair once and we had a stopover for eight hours in Helsinki. I wish we had the money/time/plan to visit the city. It was late Dec and was raining cats and dogs. Finally I saw it through your lens. One vegetable stand--I would have bought them all! I agree, the yellow bench is adorable and the poufs on the ground--how inviting. Something about being closer to the terra--I don't know if I would have been able to get up after sitting on one of those! Happy Nesting. What incredible photos! I love the cello resting on the musician's shoulder. So evocative. One hardly ever looks at that part of a cello when watching someone play it; it is beautiful, and your photo makes me wonder how that design evolved, what music the cellist was playing, and how you felt when you heard the music. The best kind of photography -- the kind that leaves you feeling, and wondering. So beautiful so clean and I have to ditto what Terry said!!! "The feeling that it leaves". Have a wonderful weekend. The yellow bench is adorable indeed. I probably would have tried those cushions just to get a laugh! A beautiful town! I'd love to visit sometimes.